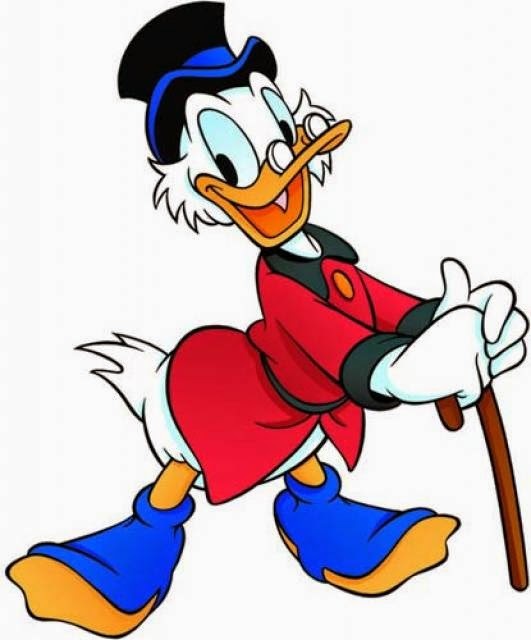 Uncle Scrooge (stylized as Uncle $crooge) is a comic book starring the stingy Scrooge McDuck ("the richest duck in the world"), his nephew Donald Duck, and grandnephews Huey, Dewey, and Louie, and revolving around their adventures in Duckburg and around the world. His character is of an extremely miser and judges everything with money, but when It comes to his family, he stops at nothing to protect them. His favorite hobby is swimming in his giant bank of gold coins. The series include few other characters like Launchpad, a pilot who crashes more planes than he flies, Gyro who is a scientist and creates new and awe inspiring gadgets, Magika a witch who is after Scrooge's lucky coin, Beagle boys who are a group of thieves with a comical element to them and cute names one of which is Babyface Beagle. Every story teaches a lesson of life and has a happy ending. Come back again to checkout my next favourite Indian cartoon/comics character whose name starts with V!